Bridgette Mayer Gallery is pleased to announce a PHOTO CONTEST in conjunction with our current solo exhibition "Nature Decor" by Kaoru Mansour! featured on our feed! We’ll be sharing your entries throughout the contest! All entries must be submitted by 4/30/16 at 11:59pm. 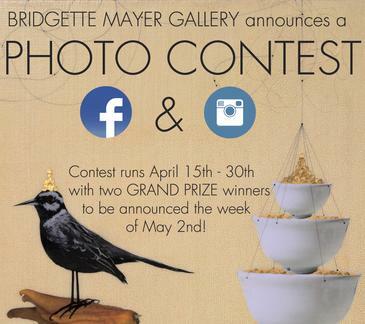 Two GRAND PRIZE winners will be chosen based on quality/creativity of the image and number of likes or shares. Winners will be announced during the week of May 2nd. One winner will receive a special limited edition print and the second winner will receive a gift certificate to Artist & Craftsman Supply in Philadelphia.